QUETTA: A judicial commission, tasked with investigating killings of journalists in southwest Pakistan, has concluded that the province of Balochistan remains the worst flashpoint for media practitioners in the country and that the climate of fear and threats of reprisals prevent witnesses to assist the authorities in combating impunity against the attacks and intimidation. These findings are noted in the Commission’s report submitted to Balochistan Chief Minister Abdul Malik over the killings of journalists in the province, including former Balochistan Union of Journalists General-Secretary Irshad Mastoi. According to the report, seen on August 26 by Freedom Network, Pakistan’s first watchdog on media and freedom of expression, the lack of a specific laws on protection of witnesses and safety of journalists, and poor standards of investigating agencies contributed to the judicial Commission’s failure in finding any evidence to fix responsibility for the killings of Balochistan’s journalists. The Balochistan government also issued an official handout on August 25, 2015 in provincial headquarters Quetta, acknowledging that the Judicial Commission has submitted the report to the Chief Minister’s Office. The handout also acknowledges that the commission did not have credible evidence to fix responsibility on perpetrators of the crimes committed against media persons in Balochistan. “Twice advertised to seek testimonies about the killings but no witness came forward to record statement,” the handout quoted the Commission report as saying, adding that it sent notices to responsible persons of journalists’ bodies and organizations working for welfare of journalists to record statement. 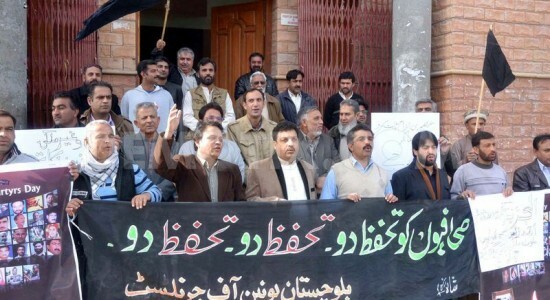 The Balochistan government had set up the Judicial Commission with local journalists taking to the streets after senior journalist Irshad Mastoi, his reporter Abdul Rasool and a media assistant were killed in Quetta on August 28, 2014. The journalists were unhappy over the Commission’s terms of reference forcing the government to expand its scope of work to investigate the killings of others journalists in the province also. The Commission report says that in absence of evidences and witnesses, no banned militant organization or government agency such as police, local administration or any other group could be held responsible for any journalist’s killing. “Law-enforcing agencies do not have any mechanism or law to protect witnesses,” the findings read. The report cites lack of witness protection law as stumbling block to have witnesses testifying in any case involving the journalist’s murder. The report “expressed concern” that witnesses did not come forward to record statements to investigate such crimes because of fear of reprisals of being attacked for their testimony. The findings also pointed that on one hand outlawed groups and organizations were trying to control the media but on the other hand the government did not set any code of conduct or safety protocols for the media. A set of recommendations were also made in the report to help make the environment improve for journalists in Balochistan.